I'm not the best fundraiser. Not more than once a month, and sometimes less often (because I forget), I've tried to selfishly remind people how they could help support TOP. 3. By sustaining the site, i.e., making a recurring voluntary donation of $6, $2, $1, or 25¢ a month. ** Sort of like subscribing to a magazine, only optional. I usually take this opportunity to thank everybody who helps out in any of those ways. Which I hereby do, again. However, a new book has convinced me that YOU should really thank these people, too! Assuming, that is, that you're one of the many who read this site without ever pitching in. According to the new book Free: The Future of a Radical Price by Chris Anderson, who's been making the television talk show circuit lately, the magic of digital distribution is that overhead is so low that lots of people can now enjoy something that is paid for by only a few. ...Which sounds good, I admit, if you're riding in the fat part of the canoe and never dipping a paddle in. If you're drafting behind the leader. If you live to put the lie to that old saying about the free lunches. But don't forget, I still need to pay my time, and times are tough as I'm sure you don't need to be reminded. And the important thing is, it needn't cost you anything. If you are going to buy a camera or a lens or any one of thousands of other photo-related products, please consider buying it from B&H Photo. Or, if you need to buy a book or CD or piece of software, just check out Amazon first. (Here for those in the U.K.) And, pretty please, remember to use our links when you do buy from B&H or Amazon. It helps. A lot. Really. Or click on our advertisers, or consider a subscription. But seriously, thanks to all of you who have helped. You are very kind, and it's very much appreciated. Meanwhile, it's that time of year again—I'm closing up shop for a few days to get some old-fashioned August R&R. (The cheek—sticks his hat out, then goes on holiday.) TOP will resume its merry ways on, around, about, or in the vicinity of August 10th. The payoff for your patience? I am at my least curmudgeonly when I return from vacation. Although I admit it can be hard to tell. In the meantime, why not delve into the Archives a bit? There's lots of fine stuff moldering away in there lonely and forgotten and not doing anybody enough good. **By the way, quite a number of these have been canceled. When this happens, I assume it's something the subscriber did on purpose; but I've found several times that it comes as just as much of a surprise to the subscriber. So if you signed up to contribute and your subscription was canceled out of the blue and it was nothing you did, well, it was nothing I did, either. I don't know what's causing it. We were talking about Kodachrome when it went the way of all things last month. On a related note, TOP reader Luc Novovitch passed by Kodachrome Basin State Park in Utah last week on his way to Escalante, and he confirms that the park is still there and still has the same name! (There was some question.) Above is a shot he took on his way through. In a "Featured Comment" to our post about adding an aerial shot to your portfolio, photographer Stan Semuskie told a cool story about being hired by Forbes magazine to shoot the home of Nike founder Phil Knight, and how he had a blast that day shooting everything he could see from the chopper. Stan has now put some of the selects from that shoot online; you can practically feel the rush of the air and the beat of the blades. Fun stuff. joined in space by a watermark and two enormous floating arrows. Finally, the always delightful Shorpy.com has some better JPEGs of the late Julius Shulman's architectural work than I was able to link to the other day, including a large, good-quality digitization of Shulman's signature picture. *Whose former assistant Carl Leonardi is a TOP reader. Modern photography is rife with Holy Grails, and certainly one of them is the reinvention of the street shooter’s ideal camera as originally embodied in the Leica M series—and in the hands of Henri Cartier-Bresson. H.C.-B. is to street photography as Ansel Adams is to landscape photography. These three and other icons used a specific tool and molded their defining concept around the tool. The tool essentially becomes a defining factor in how you take pictures. When Sigma set out to develop the DP series of cameras, they had a specific concept in mind: to house the technology of their DSLR cameras in a pocketable device. One of the models used during the concept phase was the Leica M. Although not pocketable and certainly not digital at the time, it was considered the first true street shooter’s camera. At photokina 2006, Sigma showed the first concept of the DP1. It was small enough to fit in a large pocket and promised best-of-class image quality with the first APC-size imager in a compact camera. For many, this was the Holy Grail. But no sooner was the DP1 announced than the discussions about performance began. And there was plenty of time for them; the time delay between the concept camera shown at photokina and the final version shown at PMA 2007 was considered horrendously long, to say nothing of the period from PMA 2007 and the final launch of the finished product. The longer this discussion went on, the greater the expectations—and skepticism—became. What prospective users underestimated—and in some cases, what Sigma employees before an open mike admitted to underestimating—was the challenge of packing so much technology inside such a tiny package, and doing it for the first time. An honest appraisal of the DP1 was that they succeeded at the time of launch, but just barely. Firmware updates followed quickly to handle major issues, and adept users managed to produce some amazing images. But it was clear to many that a future DP camera would require more horsepower for processing and some changes to the interface. Enter the DP2. Once again, anticipation and expectations were high, and some felt that the "little camera with outstanding image quality" came up short. However, Devices are rarely perfect, and never are in the eyes of all. Devices have an intended function and propose through their designs how to go about it. Ultimately, the buyer has to decide whether the device suits his or her needs or not. • Set the camera to M mode on the dial, and adjust the ISO, shutter speed and f-stop for the prevailing conditions. I tend to set it for ƒ/8 and adjust the shutter speed on the fly as light conditions change. If my final result will be B&W, I only adjust the ISO using the QS menu. • Set focus to MF and use the wheel to set it for a hyperfocal point around 1.5–2 meters. Again, this can be adjusted on the fly. • Use the fastest card you can. I use 32 GB Delkin class 4 cards. There might be faster cards around now. • Use the OVF and keep both eyes open to see the action evolve. Capturing the moment is about anticipation. • Turn off the LCD. It is a distraction. Set up like this, I can capture an image every two to three seconds for as long as I want. There is no shutter lag. If there is a company out there that listens to what its users want, it is Sigma. This has been shown time and again in their response with new firmware or products. As we move towards the DP3 and beyond, it is good for people to discuss problems openly in forums or blog comments. But as with any criticism, the constructive form is best, and this acknowledges what is right as well as what could use improvement. B&H is offering what might be thought of as a Recession Special on number of different bundles. Here's one attractive one, for example—the price amounts to getting the (exceedingly fine) lens for 1/2 off. At the link, click on "Zeiss" under "Brands" for lots more combos on sale. It's a camera I liked a lot, one which for many people will have only one problem...the sensor(s)! Hey, at least it's full frame. You want to be sitting down for this one. I've made pretty clear my heartfelt belief that the future will lie in informational optics and computational photography and that photographic technology will end up looking almost unimaginably different from what we've been using for 150 years. "Exploiting Collective Effects of Multiple Optoelectronic Devices Integrated in a Single Fiber"
Partial Abstract: "We show that a tandem arrangement of subwavelength photodetecting devices integrated in a single fiber enables the extraction of information on the direction, wavelength, and potentially even color of incident radiation over a wide spectral range in the visible regime. Finally, we fabricated a 0.1 square meter single plane fiber assembly which uses polychromatic illumination to extract images without the use of a lens, representing an important step toward ambient light imaging fabrics." Simple description: It's a fabric, woven out of light-sensitive fibers, that can make a photograph. All by itself. No lens. No camera. No nuthin'. Frankly, I didn't want to pay $30 to download the whole paper, but the abstract tells me enough to let me reverse-engineer the basic idea. Normal, everyday light, on the sub-wavelength scale, can interfere with itself; it acts like a well ordered set of waves. The interference patterns depend on both the wavelength and the direction the photons are coming from. Take Newton rings, for example. Get two shiny surfaces really close to each other, and you'll see bands of bright and dark colors. Newton rings tell us a lot about the light that creates them. That pattern depends on the distance the light has to travel between the surfaces, measured in wavelengths. The shorter the wavelength, the closer the bands appear together. The shallower the angle of incidence, the farther apart the bands appear. In other words, that pattern of light and dark bands contains information about the direction the light is coming from and/or its wavelength. That, I think, is the physics behind the fabric: It's looking at the interference patterns within fibers, à la Newton rings, and from that, one can extract information about where the photons are coming from and what they're like. Which is just what a conventional camera lens and film/sensor does. I can't say how far this particular technology could be pushed; I just don't know. It looks kind of like a Polaroid SX 70 print. Hold it up in front of you, grasping it by the lower right corner. An image of the scene the print "back" is facing appears on the side that you're looking at. Squeeze the corner between your thumb and forefinger, and the print freezes the image. Heck, let's make the lower left corner a zoom control. There's no reason we should be hobbled by a fixed "focal length" in our magic print; it's all in the number crunching. Also, the print doesn't "fix" the image until you squeeze the corner two times rapidly. Then it's permanent. Otherwise, you can reuse the print, until you get a photograph you want to keep. I told you you wanted to be sitting down for this one. If you’re at all attuned to camera news you are well aware of Olympus’s new PEN E-P1 camera. This 12.3 megapixel Micro Four-Thirds camera has stirred up quite a bit of excitement since its concept design was previewed at the 2008 Photokina. Olympus's own tagline has done much to ignite curiosity: "Not a compact. Not an SLR. It's a PEN." The Pen E-P1 commemorates the 50th anniversary of Olympus's Pen series of half-frame 35mm cameras. These small, modestly-priced amateur/travel/family cameras, manufactured from 1959 to 1966, were quite popular in the period just before the single-lens reflex camera design consumed the market. Oly reportedly sold over 17 million PENs so I would imagine that they're hoping for similar success with the digital version. Sentimentality aside, the main practical question for most people is whether or not Olympus's new PEN is a serious camera and not just a retro-styled toy. My answer is yes, the E-P1 is an earnest and versatile camera that can be fun to use. But it's also a camera with a few noteworthy shortcomings. What follows are my notes after working with the E-P1 daily for over two weeks. I admit to frequently using the Leica M8 rangefinder as a comparative standard. While I recognize that most readers may not have experience with that camera, I feel that it presents a more appropriate functional and performance standard than either a compact digital camera or a DSLR. Although the E-P1 is quite small it's not truly a pocket camera. With its rangefinder-like body it's much smaller than a DSLR and even smaller than a Leica M rangefinder. In fact, it’s just a bit larger than a Canon Powershot G10. When fitted with the ultra-slim 17mm pancake lens the E-P1 could be carried in a coat pocket. But with any larger lens you'll be carrying it on a strap or in a bag. The E-P1 is relatively light at 335g plus a 40g battery. But it has a solid heft. Nothing rattles and there is no hollow-box feeling to the camera; it feels full and tight. Photograph AS11-40-5903, taken by Neil Armstrong of Buzz Aldrin, arguably the most used representation of Man on the moon. See the Apollo Image Gallery for the exact sequence of Neil and Buzz's photography on the surface, and to download high quality full-frame scans. Forty years ago today, two Americans, Buzz Aldrin and Neil Armstrong, first did what had long been considered the quintessence of the impossible: they set foot on Earth's moon. Pop Culture's ceaseless Distract-the-Citizens Project has lately been taking an extended detour over the predictable if technically untimely demise of the King of Pederasty, and in that context it is a nice antidote to recall that "moonwalk" once meant something other than a signature dance move. On the day that this happened, forty years ago, our nation—indeed, all nations—felt as one; we felt a pride unalloyed by irony, and sensed a seriousness that has been missing from the civic sphere more lately; and we felt, briefly, that the stars—real stars, not just the metaphorical kind—were the limit. from the rear of the Lunar Module. Still, it's not difficult to conjure the pure wonder of what humanity did do, forty years ago today. All any of us really has to do is remember a night outdoors, camping perhaps, nestled in the darkness, far from the masking lights of the cities, looking up at the great cathedral of the heavens and contemplating the incomprehensible gulf between ourselves and the familiar half-lit pearl that so often graces our nighttime sky. It is easy to imagine men and women so ancient they could hardly be called civilized lost in reveries at the same sight and thinking much the same thoughts. The moon was the ultimate Everest—we planted a flag and then hightailed it back to where we belong, for no real reason but because it was there. But what a thing it is to have done. After we were talking about Lillian Bassman the other day, our friend Marc Rochkind (see below for a link to his blog) found a nifty article about her in the April, 1951 issue of Popular Photography which he has now scanned and put online. The article, by Walter Ian Fishman, is called "A Woman's Camera in a Woman's World." There are a few dated touches, like the line about the "girl and man," which sounds odd and patronizing now, but overall it's a fascinating look at Lillian Bassman at work. At Turnberry: What's Wrong With This Picture? One clothing company has found a unique way to advertise at the British Open. Its logo is plastered on the sail of a large boat that has been cruising along the Firth of Clyde behind the ninth tee down to the 11th tee. It's hard to miss it. That's a problem for photographers, however, because that stretch is among the most popular for pictures. Along with the cliffside beauty, they often capture the image of players with the Ailsa Craig and Turnberry Lighthouse—sometimes both—in the background. "Why would I want a photo of that?" one photographer said, packing up his gear and looking for a better spot. Speaking of the British Open—if that had been a movie script, you'd fire the writers. Fifty-nine-year-old Tom Watson, a five-time champion who led the field off and on all week, came down to the last hole with the win in hand—a win which would have made him the oldest major champion ever by eleven years. He played into the last hole well enough, but he got just enough of a bad break that he bogeyed the hole, allowing the much younger Stewart Cink, who had played under the radar all four days, to sneak into a playoff with him. The pleasantly surprised Cink then cheerfully outplayed a deflated Watson for the title—an outcome that no one, with the possible exception of Cink and his immediate family, wanted. Seldom has such a perfect story line been so capriciously sabotaged—even in sports, which is as famous for inexplicable endings as for dramatic ones. Must have been the same story writer who had the bright idea of bringing Michael Jordan out of retirement to play for the Wizards. That's the problem with sports—no one's in charge of the script. Of course no one really wants sports events to be scripted. But as Thomas Boswell wrote about yesterday (Ted Johnson sent me this): "What kind of napping divinity allows such mischief, even in the devil's game?" This is a pretty amazing photograph, although it needs its caption to yield its meaning. It's a recent photograph taken from by the Lunar Reconnaissance Orbiter Camera (LROC). If you look at the larger version, you can see the descent stages of the Apollo 11 Lunar Module, Eagle, still sitting on the surface of the moon. It's the tiny whitish speck in the middle of the picture casting the long, skinny, non-crater-like shadow. It's been there since 1969. For those of you who prefer more earthbound adventure, check out the nifty GoPro Hero, an inexpensive, waterproof, miniature still and video camera with a wide-angle lens intended to attach to helmets, surfboards, cars and offroad vehicles, your wrist, your chest, radio-controlled vehicles, or pretty much anywhere else you can think of to stick one. The company's website is a lot of fun to browse around in, and here's where you can buy one (as you can see, it's not exactly going to break your bank—although note that the price at the link is just for the camera and the housing; you buy the attachment accessories separately, based on what you need). What do you say, should I attach one to my forehead on my next trip to the doggie park? I think the suction cup attachment might work for that. Featured Comment by David A. Goldfarb: "This is not a camera you attach to your forehead on your next trip to the doggie park. This is a camera to attach to your doggie's forehead on your next trip to the doggie park." Featured Comment by Ctein: "I suspect most people don't realize how far removed the Apollo photos they remember are from the originals. The original chromes never left the NASA vaults. A very few institutions, including the Smithsonian, got first-generation 'master' dupes. A few very elite publications got second-gen dupes. Most publications got third- or even fourth-gen dupes. "Add in another generation for the printed reproduction and you're typically 4 or 5 generations away from the originals. "How big a difference did that make? I've been lucky enough to see some of the Apollo chromes in the Smithsonian archives. The difference between those and what typically appeared in a good publication is like the difference between printing a negative on Grade 2 paper and Grade 4. Not to mention the color and saturation distortions commensurate with that. "Michael Light was not quite so blessed; he had to work off of first-generation 'master' dupes. Perceptive viewers will see artifacts, e.g., some small amount of dark haloing around the blackest shadows, which are evidence of slight degradation in the duping process. His results are still remarkable and gorgeous. "Those who want some sense of what the photos really looked like owe it to themselves to own these books. "Digital imaging has been a true blessing to space photography; no longer do we public have to suffer with distorted and degraded n-generation offspring." Featured Comment by David A. Goldfarb: "This is not a camera to attach to your forehead on your next tript to the doggie park. This is a camera to attach to your doggie's forehead on your next trip to the doggie park." 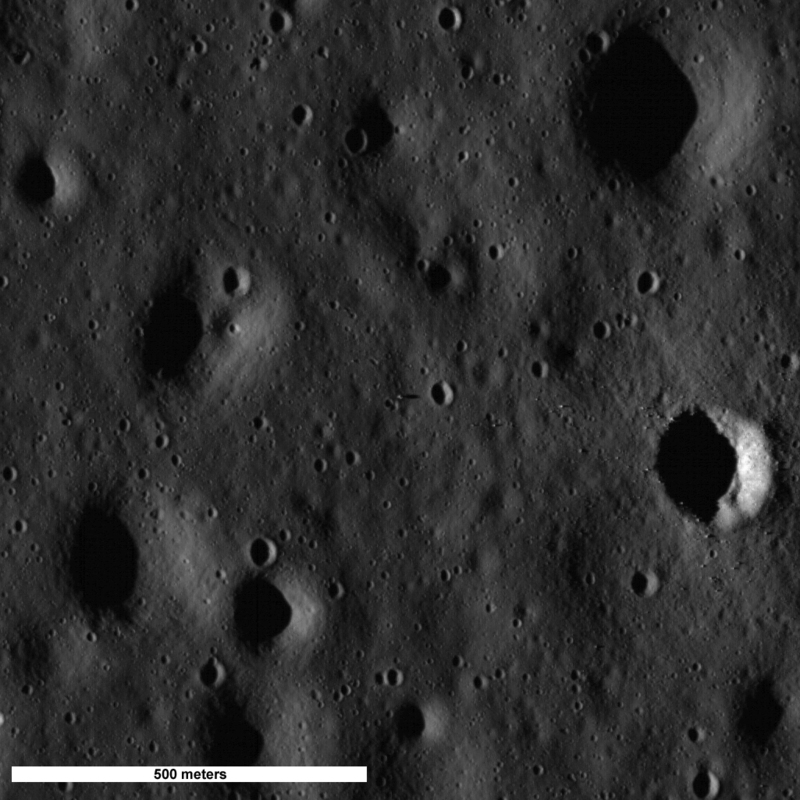 Featured Comment by Rod S.: "I really enjoyed the heads-up on the new LRO photography, Mike. Hey, the Apollo 14 picture is particularly fun: the astronaut's walking trail leading over to the ALSEP jumped out at me even before I'd scrolled to the enlargement. "I'll second Ctein's recommendation of Full Moon. Michael Light sifted through NASA's collection to find those that struck him as a photographer, steering away from the most commonly seen photographs. Most of the B&W photographs were shot for geological control but most of those he selected are stunning. The first time I turned the pages of the book, I cried, because it took me to those valleys and mountains in a way I had not previously experienced. "In a discussion with Michael Light at the opening of his exhibition in Sydney, I had remarked about the several copies of the book that I'd seen which included flattened lumps of white clay within the pages. Michael explained that the clay was used during production (by Amilcare Pizzi, in Milan) to address the problem of pages sticking together due to the unusually large amount of black ink used in the printing (for the lunar skies). On the issue of duplicates, Michael told me that he was able to use a fresh new set of 'master' duplicates which NASA had fortuitously prepared shortly before he made his request, so he did have good fortune there." Julius Shulman, who died two days ago at an advanced age after a full life, is one of those photographers who are well known in their sub-speciality but not as well known among the general public—including, even, photography enthusiasts. Mr. Shulman is probably better known among architects than he is among photographers. For a little more background: we were tipped off by reader Allan Connery to a video of Calgary architect John Brown giving a virtual tour of Pierre Koenig's Stahl House. The Stahl House was the subject of Julius Shulman's most famous photograph, a picture that came to define mid-century Los Angeles modernism. And here's a link to information about the award-winning film about Schulman, "Visual Acoustics," compliments of reader Rodney Dean. Jimmy Forsyth , also recently deceased, was a methodical documentarian of the "Geordies" of Tyneside (in the Northeast of England). A lifelong Socialist, he was blind in one eye, described as "a single man who was often lonely," and he created his work mostly living on "the meager resources of the dole" (what Americans would call welfare). Ironically, his last book, the very inexpensive Jimmy Forsyth: Photographs from the 1950s and 1960s , was published only a few weeks ago in June (the link is to Amazon U.K.; Amazon U.S. doesn't seem to have this title sorted yet). The obituary at The Guardian is a vivid and charming glimpse into the life of a man who must have been "a character." Elderly but still thriving, the once and future fashion photographer and classically free-spirited bohemian Lillian Bassman was the subject of a delightful short profile in The New York Times yesterday, written by Ginia Bellafante. The story of her onetime repudiation of photography and her discovery of Photoshop in old age is fascinating, as are the details of her independent life (I was especially touched by the brief description of her lifelong romance, from age 6 till death did the two part). She's also the beneficiary of a new retrospective, upcoming from Abrams. Called simply Lillian Bassman: Women , it's only available for pre-order at the moment. The new book, says the publisher, will have "more than 140 of her best images reproduced in stunning tritone, including many never published before and others not seen since they appeared in the pages of the legendary Harper's Bazaar of the 1950s." Much anticipated by fans of fashion photography, Lillian Bassman: Women is expected by October 1st. Featured Comment by Carl Weese: "As mentioned in the Times article, Ms. Bassman has a show of her prints opening tomorrow afternoon (Saturday 7/18) at KMR Arts Gallery in Washington, Connecticut. I understand the artist is planning to attend." Julius Shulman talks about his most famous photograph. 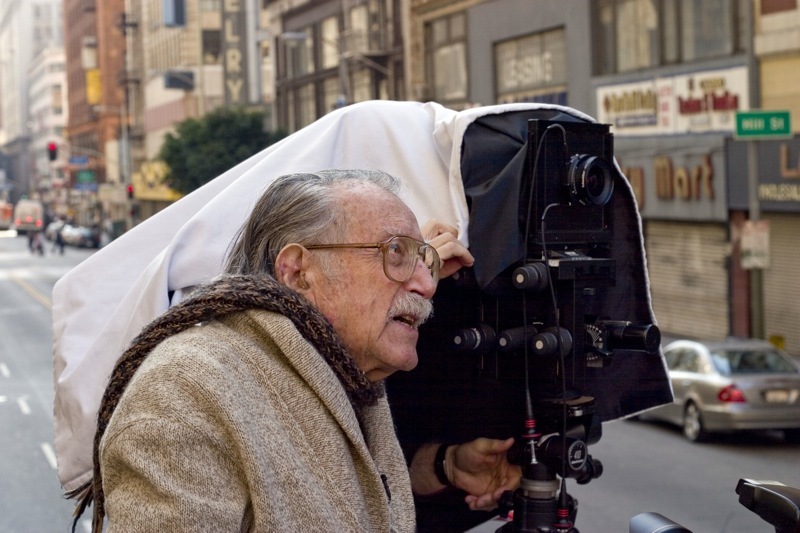 Julius passed away last night, in Los Angeles, at the age of 98. His obituary at The L.A. Times. Today is the 40th anniversary of the launch of the moon shot. NASA is streaming the audio of the entire mission, from pre-launch to splashdown, in real time, online. Featured Photoshopping by Moose: "Interesting what a little contemporary image processing can do. The proportions change dramatically. "PTLens fisheye correction, NeatImage, PS Healing Brush, FM IntelliSharpen II." Featured Comment by Clinton Bersuch: "NASA has also digitized some highlights from the cockpit voice recorders. It's interesting (to me anyway) how, on a couple of the recordings, the crew spends a fair amount of time talking about what lens and shutter speed/f stop combinations to use for various photographs they want to get. It sounds like they're using some sort of 'cheat sheet' with exposure information for various film types and subject matter. In one particular conversation Neil Armstrong advises Mike Collins to open up half a stop so he can get detail from the Moon's surface. These guys were many things—test pilots, explorers, etc., but it's easy to forget that they were also very much photographers and they spent a great deal of time making sure they got that part of the mission right. I can't say that I blame them." UPDATE from Barry Hill: "The JFK Mueseum seems to be doing the audio in realtime as well and seems to be a better site using flash photos and videos." Are you one of those photographers who keeps buying camera bags to excess, in a futile search for just the right one? I once knew a guy who had thirty camera bags—not because he collected them, just because he kept buying them hoping each time the new one would be better than all his others. Well, there may not be any such thing as the perfect camera bag, but this has got to be a prime candidate for the coolest one. It goes on sale tomorrow at auction at Bonham's in New York City (Sale 17402, Lot 285), and it's expected to sell for forty to fifty thousand dollars. And it's covered with dust. Not only that, but you want it to be. It was used to store 16mm and 70mm film magazines for astronauts Jim Irwin and Dave Scott in the Apollo 15 Lunar Module. The crew performed two 7-hour EVAs (extra-vehicular activities) and came back to the LM covered with lunar dust, which got all over the camera bag. That's the dust. Just the thing for the photographer who already has every kind of camera bag under the sun—one more, dingy with dirt from the moon. None of your friends have one! Comes complete with deaccession papers from the National Air and Space Museum. Featured Comment by Rod S.: "Dave Scott and Jim Irwin performed three, not two, EVAs on the lunar surface. I watched all three through three consecutive nights here in Australia, where we had complete coverage because, as I recall, we took the feed directly from the radiotelescope at Parkes, which happened to have the moon in sight for each (they were 24 hours apart). The experience is one I treasure - along with meeting and talking with Jim Irwin in 1989, two years before he died. "Andy Chaikin's book A Man on the Moon: The Voyages of the Apollo Astronauts reports that the durations of the three moonwalks were, 1st: 6 hrs., 32 min. ; 2nd: 7 hrs., 12 min. ; 3rd: 5 hrs., 40 min. "Here in Australia, it's the morning of the 16th of July, the 40 year anniversary of the launch of Apollo 11." UPDATE from Bob Peterson, July 16th: "According to the auction Web page Lot 285 'Sold for $36,600 inclusive of Buyer's Premium' "
Prepare for a rant, people. Over my thirty years of writing about photography, I've spent an unfortunate amount of time having to argue with people who think arithmetic is a substitute for reality. I can't say whether photographers are more prone to this delusion than other folks; it's just that I have to deal with it in the world of photography. If you are not guilty of the following misjudgments, then this is not aimed at you, so please don't take umbrage. There is nothing mystical about the craft of photography; it does reduce to physics and mathematics. But that doesn't mean that short, high-school-level algebra equations reflect that reality. They are born of insufficient assumptions, inadequate experience, and some outright error, backed by a strong human inclination to find some way to rationalize whatever one believes, no matter how many mental hoops one has to jump through to do it. For your edification, I present diverse examples. What they have in common is that they're all born of that irrationality that Simplicity=Truth and that what one has always believed must be True. The equation that relates luminance, exposure, and film ISO is very clean. The real world is very messy. Many photographers have made pronouncements about how film manufacturers lie about film speeds. They do not understand how errors in exposing and processing compound; collective errors greater than one third stop are the norm. Second, they rarely know what their meter is doing. They read 18% gray cards without realizing that a properly ISO-standard-calibrated light meter's going to give them an exposure recommendation based on an assumed 12% equivalent reflectance. (Yes, true, according to both the written specs and the scientists at Kodak who know more about this subject than any of us! Don't argue!) Even those who do know that don't know how closely their meter's manufacturer followed the standard. Some are scrupulously good; others not so much. I've written several columns about this, explaining how the simplistic assumption that one should have a blur circle equal to the size of the physical pixel just plain doesn't work well in the real world. That nice simple Rayleigh limit diffraction equation is so seductive. Problems? The theoretical blur circle isn't what you really get in the sensor plane ,and a 1:1 match between pixel and blur circle doesn't produce optimal image quality. "Diffraction—Quantum Weirdness in Your Very Own Home"
"Why 80 Megapixels Just Won't Be Enough"
Need I belabor this one after several recent articles? The nonsense adamantly spouted by some people about how depth of field "should" work inspired this post. Even when faced with correct math, and computational and experimental evidence, some still insist upon hanging onto their simple and erroneous rules of thumb. Rarely does one see such clear-cut evidence of errancy. This one is a perpetual problem. In the course of recommending (or dissing) a particular piece of equipment, someone will announce that "on average" Category A is better than Category B equipment in some aspect. That's if they're being scrupulous. Many folks don't even bother to include the phrase "on average." This is completely useless advice when you're shopping; you don't buy an average, you buy a specific piece of equipment. That particular product may or may not perform better than one in a different category, no matter what the average says. Further, those "average" assertions are often based on some erroneous theory rather than real data. A full frame camera does not necessarily provide better image quality than a smaller-sensor camera. An ƒ/2 lens does not necessarily provide usefully shallower DoF than an ƒ/2.8 lens. It depends on the two cameras/lenses you're considering. The variance is not ignorable. If you've got real-world knowledge about to specific products, then you're making a legitimate comparison. Otherwise it's just hot air, devoid of any useful information. Save your breath, and save us having to listen. If you're thinking about trying to write a rebuttal to the facts, don't bother. You will be wrong. This is my field of expertise! If you're a surgeon, I wouldn't argue the fine points of your surgical specialty with you. I know what I'm talking about. Class dismissed. later works volume 4, page 174. "Of course, Ctein is more succinct." In days of yore, when men were men and cameras took real pictures, one occasionally heard of hockey pucks like the Canon New F1 (for some reason, the New F1 was always described as a "hockey puck") being dunked in seawater, rescued, resuscitated (usually with a soak in fresh water followed by air-drying, after being opened as much as possible to said air) and revived, to go on soldiering for years afterwards. Nothing could stop 'em. But a modern DSLR? All those delicate electronics? Forget it, right? Wrong, pixel-breath. Planet5D tells the rather remarkable story of two Canon 5D Mark II's that went swimming and lived to shoot again, in what must have been very alarming inadvertent tests of their weatherproofing. Who'd a thunk they'd survive a dunk? Yet they did. Just be sure to be careful where you're looking, because that's being recorded too! Thinking about the Sigma DP2 has made me continue to ponder the economics of camera manufacturing in the digital age. Electronics are not kind to low volume manufacturers. Components like sensors, LCDs, and the development cost of the software/firmware drop dramatically in price as volume increases. Furthermore, there is an economic benefit to having accumulated experience in designing cameras that isn't easily quantified, but certainly exists. Finally, if you have other products that can benefit from the technology, the cost of development is reduced on a unit basis. I'm sure that's why cameras like the M8 are so expensive, and why they are not very refined electronically. And Sigma, which I feel is not overloaded with cash, has suffered even more. Another example is the Olympus Pen vs. the Panasonic G series: Olympus can't or won't spend the money on the high level of contrast autofocus that Panasonic has, so it is slower to autofocus. Also, the Olympus has a relatively crude LCD compared to the competition. I am sure these shortcomings are related to direct cost, accumulated experience and the ability to take the technology and apply it to other product lines. It's scary to think that Olympus is at a serious disadvantage vis-à-vis their competition, but I think they are, and will, over the long term, suffer for it. It also means a fair price for an improved Sigma DP2 might be $1200, at which point Sigma might estimate they would sell 10 cameras, not 10,000. Which might be too bad: a $1200 camera that has the benefits of the DP2 with quick autofocus and file flush times is probably salable in decent volumes. But it takes a lot of guts in any corporation to price to value rather than pricing to demographics. I was the general manager at Callaway Cars in the mid '80s during the Twin Turbo Corvette production. We charged $20,000 for the upgrade at a time when the base Corvette was $40,000. Plain and simple, it cost a lot of money to do the low-volume remanufacture required to make a good car. GM thought we were crazy and would never sell the option, but agreed to give us an option # and let us run with the program. We thought we'd sell 40 or 50 cars. We ended up selling 188 the first year! There are people who were willing to cough up the dough because they got a good product, but I can't tell you how many calls I got from shade-tree mechanics about how they could produce a better car in their garage. My response was, "okay, go ahead." They didn't have to worry about providing a warranty, sales and service support, and of course a car that was reliable and street legal. It takes a lot of money to do that and the customer ultimately has to pay. The smaller the production run, the more the customer has to pay! The other thing that hits a small volume manufacturer is when something is wrong with the camera even after it has shipped to the public. Again, at Callaway's, we changed out many components in the engine to improve reliability, to the point where almost everything was new. But we still ended up having problems that were related to a timing gear at the base of the distributor. GM had changed the component to reduce cost, and basically the looser tolerance meant some—repeat, some—wore out faster than the original component. In the standard car, other than running a bit poorly, nothing else happened. In the turbo car, under boost, the retarded timing caused the exhaust gas temps to soar and could cause the car to catch fire! "Heat damage" was the euphemism GM used. Anyway, we had to buy a special race-prepped gear to fix the problem, which was expensive to say the least. I'm sure Leica and Sigma have had similar types of issues to deal with in their development processes, which looks stupid to the public but which is the price of being small and taking risks. For security's sake, I need to mention that the stones are all kept in safety deposit boxes, not in his home, which adds an extra 2–3 days to the typical MTBS (mean time before shipping). Photos by my niece, home for summer break! Enjoy. I'm far from an expert in aerial photography, but I just wanted to add one small comment to the previous post: having one aerial photograph in your portfolio can be a real plus for you, and I recommend it. For many years I've had just one single aerial photo in mine*, but people almost always linger over it and ask about it. In general, photographers want their portfolios to say "I'll do anything," and that's usually a mistake. (Have I written a post yet about why you should never have one wedding photograph in your portfolio? If I haven't, I've been meaning to.) Your portfolio should target a specific clientele and work to convince that clientele that you're the absolute best person for the job at hand—it shouldn't be a hodgepodge of jobber work of various kinds. However, having a token aerial shot might well be the exception to that rule. It really does say to clients "I can do anything" in a meaningful way. Generally, amateur photographers who do casual pro work once in a while aren't trusted with the budget for a plane or a helicopter. An aerial implies that you were trusted with just such a important job—even if you weren't! Adding one aerial shot to your portfolio isn't as hard as it sounds. You might have a friend who flies. Small planes and helicopters can be rented for not that much money. And there are even things like biplane rides at air shows and tethered hot air balloon rides that can get you way up in the air for very little inconvenience or expense. Best of all, while it's just as hard to get a great aerial shot as it is to get any other kind of great picture, getting a good one is fairly easy...lots of things look more interesting from high above, as most of us know from peering out the window of a descending airliner when the air is clear and the light is nice. Anyway, I highly recommend adding an aerial shot to your general portfolio. It's unlikely to get you any work shooting them, but it says good things about you all the same. *I'd show it to you if my darned scanner worked, but oh well. Featured Comment by Dave: "As a former flight instructor I can tell you that if show up at your local airport, a flight instructor will be happy to help you take aerial photos. Most flight instructors will do just about anything to log additional flight time. A photo flight is considered a cherry assignment for a starving flight instructor. It beats teaching someone how to land. 1) Plan ahead—an hour of flight time will cost from $60–$120. You'll not want to waste a minute. Spend at least an hour with your pilot planning the photo mission. The pilot will need to have a plan for navigating to the photo site and dealing with local air traffic control. 2) Schedule to fly during good lighting conditions. Early morning or late afternoon. 3) Get some latitude and longitude info from google maps. Most aircraft are now equipped with GPS. If you come prepared with lat and long data you'll save the pilot a lot of work and possible wasted flight time. 4) Ask if you can fly the plane. A flight instructor won't mind handing the controls over for awhile and teaching you some turns or something more exciting if you're brave." Featured Comment by Steve Renwick: "As a Cessna driver, I'd like to add a few comments. "Make sure that you and the pilot are on the same page at all times, i.e., you both know how low the plane will fly, you ask before opening the window, etc. Never surprise the pilot. "If you are not accustomed to small planes, it would be a really good idea to take a ride without your camera at first, just so you know what to expect. "As somebody else said, looking through the viewfinder whilst going in circles is a very good way to upset your stomach. Don't try to tough it out, as that won't work. Look up at the horizon and ask the pilot to fly straight and level for a while. A little delay is better than the alternative." Featured Comment by Stan Semuskie: "I agree with your comment about the aerial photo in your portfolio. A couple years ago I received a call from Forbes.com to shoot a photo of the home of one of the richest guys in the U.S. I was kind of taken aback by the request, and asked if the person would set up the shoot. She said just rent a plane or helicopter, find the house and take a picture. I still wasn't convinced that I could do it so I called the local airport, in Hillsboro, Oregon, and much to my surprise I could rent a helicopter with a pilot for $125/hr, and they would only charge me for what I used in 6-minute increments. I did the job, used up the whole hour and shot much more than the house—I also shot my company, my house, and all my friends' houses from the air. It was one of the best experiences I have had. "By the way, the person whose house I shot was Phil Knight (founder of Nike). He just happened to live in my town of Hillsboro, and I was lucky enough to get the job from Forbes. I would recommend anyone to call around and see what it costs for an hour of air time. I think many will be very much surprised at how inexpensive it can be."